Toblerone is synonymous with Christmas for me and has been for as long as I remember! 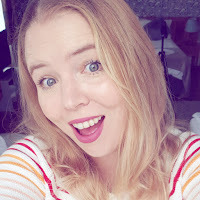 I love the almond nougat inside Toblerone, it's the thing which makes it stand out and it's ever so slightly moreish, leaving you wanting another of those lovely triangles! We were gifted a fondue set and some Toblerone in order to try out some Toblerone fondue. 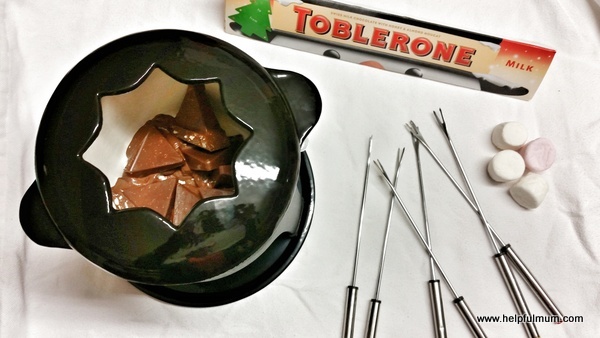 You need to place the Toblerone into a heavy based saucepan (or fondue set) over a very gently heat. 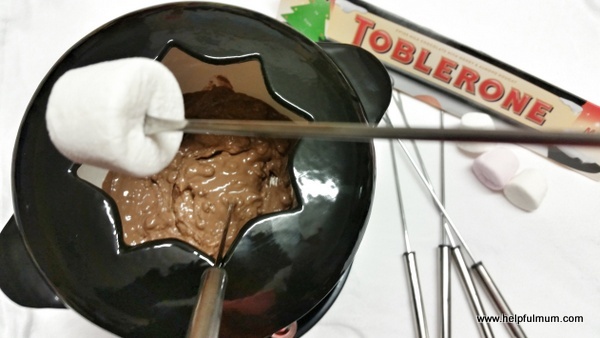 Add the surup and cream and stir continuously until the Toblerone has melted and is warm. Then pour into a warmed serving bowl. Serve with marshmallows and a choice of fruit. In the recipe it does say to cut the Toblerone into small pieces, but I have to admit to not reading the recipe properly and just chucking the 200g straight into the fondue set. Then I added the milk and golden syrup. I made sure that I stirred it regularly so that it was completely melted before we dipped the marshmallows in. 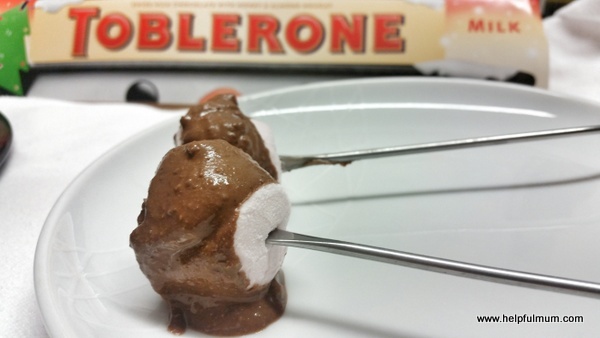 The best part about Toblerone fondue is that the almond nougat bits do not melt, leaving you with a really nice crisp part to bite into. The only downside is that you can't eat more than a couple of marshmallows because it's a bit too sweet! It's definitely a good idea to use some fruit. I think that mango or apple would work really well with the different flavours in the Toblerone. There are six products in the Toblerone range, original, white chocolate, dark chocolate, fruit and nut chocolate, honeycomb crisp, and Tobelle (twenty slender triangles of milk chocolate). There's plenty of choice for any chocolate palate! Check out Toblerone's website to have a look at the other recipes you can try. 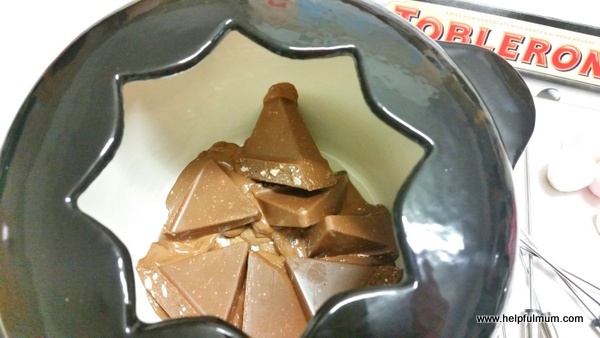 I can't wait to make the Toblerone cookies! Disclosure: We received Toblerone and a fondue set for the purpose of this review. This had no impact on my post, which is honest and fair.